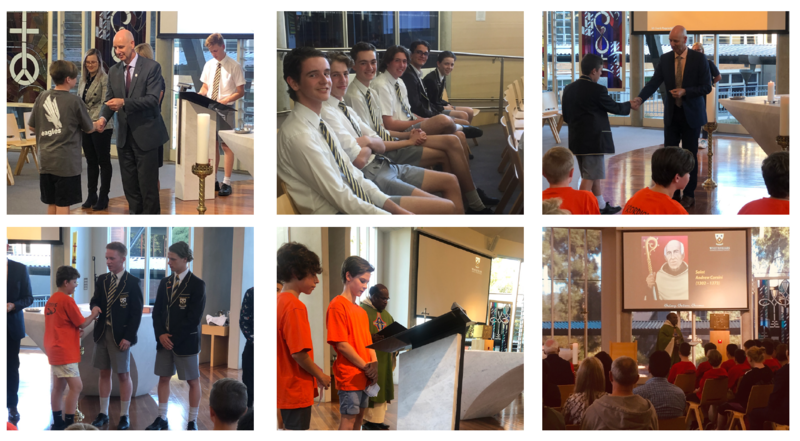 One of the wonderful rituals for our Year 7 families and students are the Year 7 House Mass and Badge Presentation evenings. The Year 7 families and students of each House come together and begin with a celebration of the Eucharist, led by Father Paul Sireh. This is an integral part of our Catholic Carmelite tradition. This is followed by a badge presentation ceremony whereby every Year 7 student receives a House badge presented by the College Principal, their House Leader, Pastoral Care Teacher and House Captains. This ritual symbolises their belonging to the House, a special part of being a Whitefriars student. The evening finishes with a supper organised by the Parents’ Association, giving the families an opportunity to meet their son’s Pastoral Care teacher and each other. A big thank you to Michal Mimmo and Michelle Staplefeldt from the Parents Association, House Leaders and Pastoral Care Teachers, Joshua Vujcich, Father Paul Sireh and Trent Collins for the work they have all done in the preparation and running of these evenings.